West Windsor, N.J.: Excitement was in the air at Trenton's War Memorial building on May 12, when the James Kerney Campus of Mercer County Community College hosted an enthusiastic audience for its Celebration of Academic Achievement. Receiving awards and certificates were 209 students who completed both credit and noncredit programs. Keynote speaker Maurice L. Coleman of Bank of America clearly inspired the large audience of students, their families, faculty, staff and board members. A Trenton Central High School graduate, he told the story of his mother, who, after having three children, returned to college at MCCC, continued her education, then taught school for three decades. Coleman credits both his parents for his success because they always put education first. 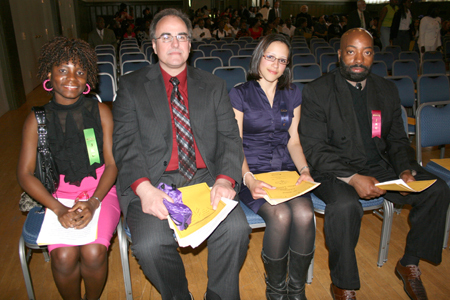 The event honored students who have completed their programs -- both credit and noncredit -- at the James Kerney Campus. Professor Alvyn Haywood served as master of ceremonies, and Provost Monica Weaver welcomed guests and presented awards. The 56 degree program graduates began their studies at the James Kerney campus or took most of their classes there. They will also be part of the college's graduation ceremonies on May 21. Also receiving awards were 45 graduates of the Career Training Institute, which prepares students for office and culinary careers, 50 graduates of the GED (General Equivalency Diploma) program, and 58 English Language Institute graduates from 20 different countries. Twenty-two students were presented with scholarships. Donors include the Urban League Guild, the Metropolitan Trenton African American Chamber of Commerce, the Arthur J. Holland Scholarship Fund, named for the former mayor of Trenton, and two anonymous donors. Student speakers who represented their programs, from left, were Adren Paul-Coker, associate degree graduate; Greg Ostrum, Career Training Institute; Mariana Ampie, English Language Institute; and Lawrence Foreman, GED program. 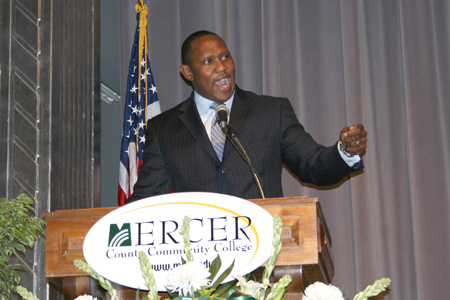 Inspiring keynote speaker Maurice Coleman of Bank of America told the story of his success. He is a Trenton Central High School graduate. 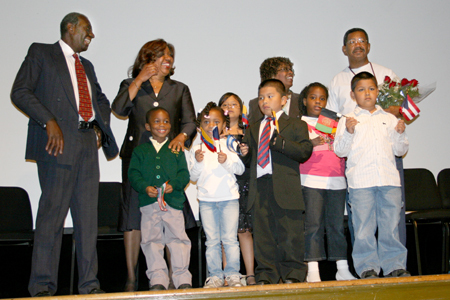 Children paid tribute to two long-term MCCC administrators, Dean Edward Frederick and Vice President Beverly Richardson. Mrs. Frederick and Mr. Richardson are at right. During a special tribute, with the beautiful voice of the late Director of Admissions Don Jones on audio, a group of small children walked down the central aisle to the stage holding international flags and singing "We are the World." Escorted by Provost Monica Weaver, the children joined in thanking two long-time administrators at the James Kerney Campus, Dean Edward Frederick and MCCC Vice President Beverly Richardson, who retired in May. Both received awards of appreciation. The event concluded with refreshments prepared by Career Training Institute culinary students.